Spa Crest Europe has declared that its launch of an exclusive distribution deal for the Tuff Spas range made a strong impact with hot tub retailers and trade visitors during SPATEX. The Tuff Spas models are synonymous with extreme durability and unique integrated cover lifters and demonstrations of their strength were promoted during the three-day SPATEX wet leisure showcase by Spa Crest Europe Managing Director Tony Welsby and Gatwick-based Waterstream Group duo Alex Kemsley and Simon Dickson; as part of a joint distribution initiative secured at the International Pool & Spa Expo in Orlando. 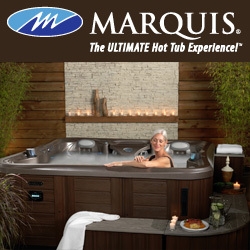 Tony, who has also been promoting enhancements to the carbon-fibre reinforced Hampton, Hatteras and St Augustine in the Spa Crest Coastal mid-range of hot tub options, which includes the WhatSpa? Best Buy Award-winning Charleston, reported that the Tuff Spas debut in front of a British trade audience made an instant splash on the first day of SPATEX. “We have had a very positive response to our Tuff Spas launch and a lot of visitors to our stand during SPATEX reported that they were interested in promoting these models in their showrooms,” said Tony. 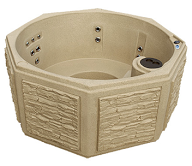 During SPATEX, a video was being shown of Tuff Spas from the Arizona-based manufacturer being dropped from a crane and driven into by a large vehicle to illustrate that they live up to their name and reputation of being a high-quality range of robust roto-moulded hot tubs, which have a lifetime warranty on their shells. A Tuff Top Series of models, including the two-seater TT150, four-seater TT250 and TT650 for five to six people, has already cemented a strong foundation in the USA and the UK distribution trio believe they will enjoy similar success with British retailers and their customers. The TT Series and TS Series; which includes the two-seater TS150, the round TS350 for three to five adults, pictured, and TS550 for six to eight adults with unique integrated steps design; are designed to withstand the blistering heat of the deserts of the USA’s south west, as well as the Arctic conditions of Alaska. Along with a ‘plug-and-play’ format with a cord that can be plugged into a 13A socket, the Tuff Spas models have advanced Gecko controls, which have been designed with two large access panels on all four sides for easy accessibility to the equipment. Design features also include deep footwells and ergonomic variable depth seating to fit a variety of different body types and sizes; including, bucket seats, bench seating and cool-down seats. “We originally started out in the wet leisure industry with a hot tub hire service and we’ve come full circle now with our distribution deal for these models that are ideal for the demands of being used for hire purposes,” said Waterstream Managing Director and BISHTA Chairman Alex Kemsley. Filed Under: Event news, Events & expos, New products, News, News & views, Products, Retailer interviews, Sales & marketing Tagged With: BISHTA, hot tub retailers, Spa Crest Europe, SPATEX, Tuff Spas, Waterstream Group, WhatSpa?